To the magician and to most audiences, card manipulations are the most fascinating type of card trick. Since the manipulator's skill is the only determining factor, once a degree of card dexterity is acquired the performer can go on to learn tricks sure to entertain, at any time, with no further preparation, using any available deck of cards for the performance. In this five-book series, Jean Hugard, master performer on stage and with small groups, teaches the passes, palming methods, shuffles, arm spreads, color reverses, sleights, flourishes, set-ups, and tricks in the best professional versions. After showing the basic manipulations, he develops a number of exceptional tricks where the manipulations are used. 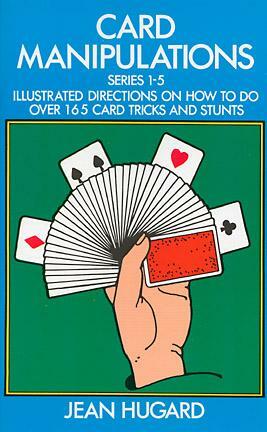 A number of illustrations and step-by-step explanations teach each detail as the trick would be given in a performance. By working through these tricks, from the simple to the complex, the magician learns his skills in a professional manner and also gains a wide repertoire of specific tricks. Throughout the book a great number of manipulations and over a hundred tricks are explained. The keys to these tricks are not well known outside professional magicians' groups. But to the advanced beginner or semiprofessional who has some degree of card skill, the manipulations and tricks developed in this book will add to the dexterity of the performance, give hours of rigorous skill-developing practice, and help build a professional, well-rounded repertoire with cards. Reprint of the original 1934 edition.